This chocolate lava cake is so rich, fudgy, and downright indulgent. You won’t believe how easy this heavenly chocolate dessert is to make! This post may contain affiliate links. Read my disclosure policy here. This recipe was originally posted on Feb 20, 2015, we’ve tweaked it a bit since then. The best part about this chocolate lava cake is that it can be made hours in advance, and refrigerated until ready to serve. 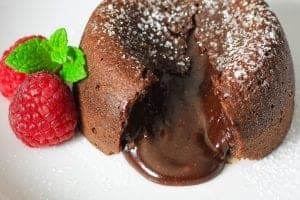 If you want to impress your guests with a warm dessert, this chocolate lava cake recipe is ready in a matter of minutes! Melt the butter and chocolate chips over a double boiler. Then, in a separate bowl, beat the eggs until they become foamy and add the powdered sugar, vanilla, and melted chocolate. Now sift the flour in and whisk all the ingredients together until the chocolate batter is smooth. 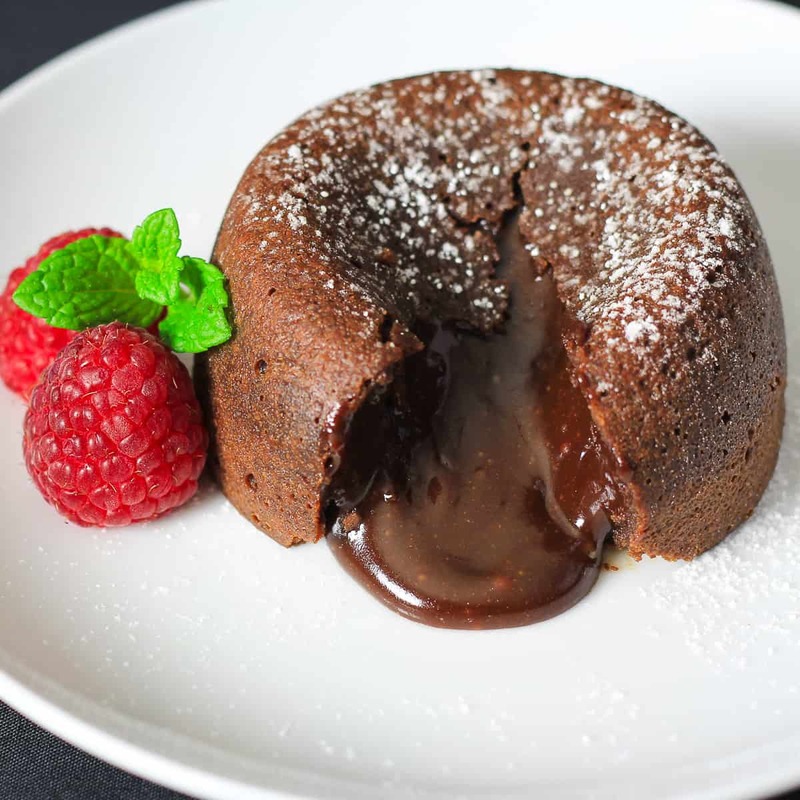 Pour the chocolate lava cake batter into the greased 4oz ramekins and bake at 410 degrees Fahrenheit for 8 minutes. The best way to remove the lava cake out of the ramekin is by making sure to grease it generously prior to filling with the lava cake batter. If you don’t, it will stick too much. The lava cakes will be super hot when you take them out of the oven, so don’t try to flip it with your hands at lightning speed (obviously, you’ll burn yourself). Instead, place a small plate on top of the ramekin, then grab the side of the ramekin with a kitchen towel and flip it over. And voila its all in one glorious piece, so you can go ahead and Instagram it. Can I make chocolate lava cake ahead of time? Sure thing! Once you pour the batter into the greased ramekins, cover each lava cake with cling wrap and place in the refrigerator. Once you’re ready to bake the lava cakes, bake at 410 degrees Fahrenheit for 10 minutes. How long can I keep chocolate lava cake in the fridge? You can keep the lava cakes refrigerated for up to 2-3 days before baking. Can you freeze molten lava cakes? Yes, you can. 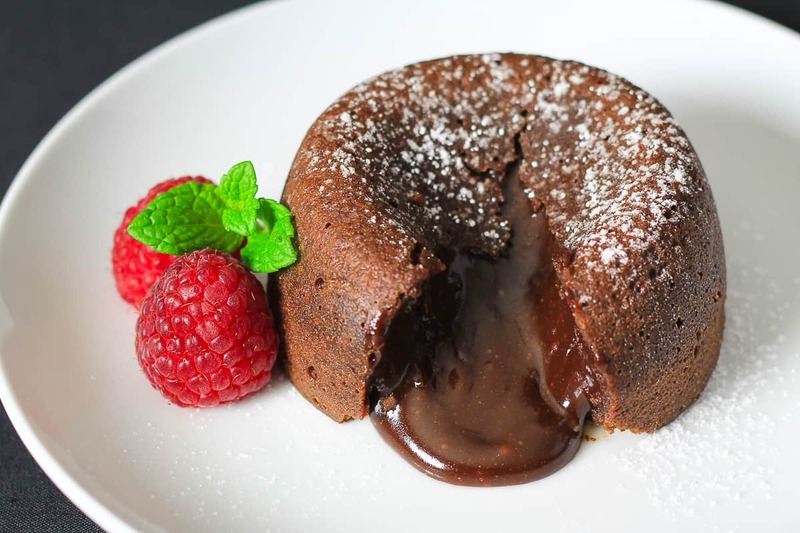 Cover each molten lava cakes with cling wrap and keep frozen for up to 3 months. Bake the frozen lava cakes at 410 degrees Fahrenheit for 11 minutes. Decadent molten chocolate lava cake that goes perfectly with a scoop of ice cream. Preheat your oven to 410 degrees Fahrenheit. Over a double boiler, melt butter and chocolate chips . Keep stirring until it reaches a smooth silky consistency. In a bowl, lightly beat the eggs and egg yolk. Then beat in the powdered sugar, vanilla, and melted chocolate. Sift the flour with a mesh strainer and whisk it into the chocolate mixture. 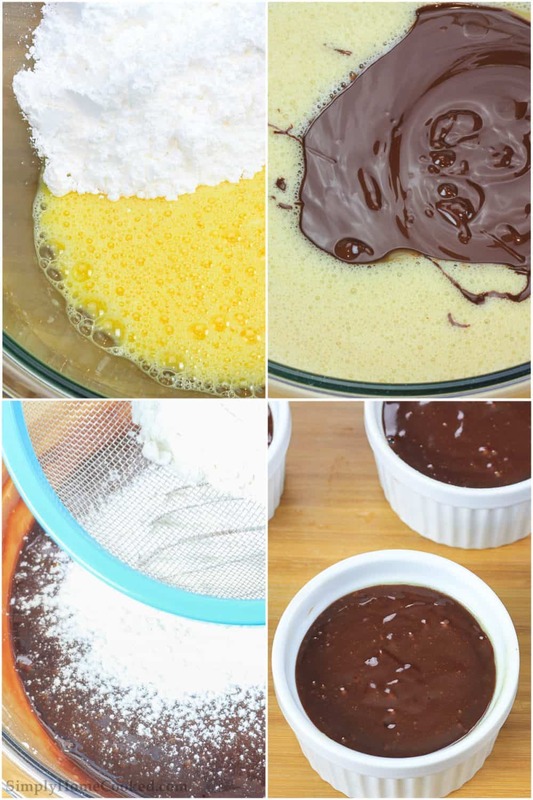 Spray each ramekin with nonstick spray and fill with the batter. Make sure NOT to fill each one all the way to the top. I used 4 oz ramekins. 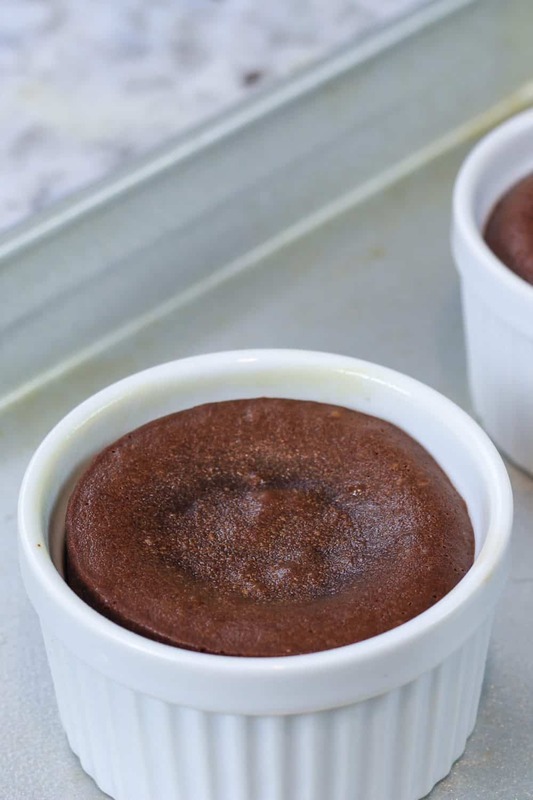 Place each filled ramekins on a baking sheet and bake for 8 minutes.If you refrigerate your lava cakes, bake them for about 10-12 minutes. Once they're done, flip them over onto a plate. Or you can always eat them straight out of the ramekin if you prefer not to flip them. Serve warm with berries or ice cream. Can i use baking chocolate (like the Ghiradelli bars) instead of chocolate chips? Hi Jennifer, yes you most definitely can. Can I use 3 oz ramikins? I have 8 that size. How will that change the cooking time? Hi Karen, yes you can use 3 oz ramekins but they will bake faster. I’m not too sure how much faster though. Loved your recipe…very easy to try and I am sooo happy i could finally find an easy and exact recipe for lava cakes …kids loved them! Thank you!! Just now made them. Omg they came out amazing and tasted amazing as well. Perfect quick luscious dessert. Thank you for such a wonderful review Jamie! I promised a student I would bake these for them. I teach all day & there is no way I could bake them right before class. Could I bake the lava cakes & then refrigerate them? Maybe let them come to room temp or put them in the Mike just to get them warm? Hi Rachel, since you are teaching all day, refrigerating and microwaving later would probably be your best option. I’ve never tried microwaving lava cakes before, so I can’t say they will taste just as good. But theoretically your method should work. If you make them in advance, do you pre-bake them and refrigerate, then bake again for 10-12 minutes when ready to serve? Or do you refrigerate the batter in the ramekins, then bake them? Hi Trish, if you want to make them in advance, refrigerate the batter in the ramekins unbaked. Can I make these in foil cupcake liners? How much would you reduce cooking time? If I refrigerate them, how long should I heat them up for? Hi Grace, in step #4 I mentioned that you will need to bake it for 10-12 minutes if you refrigerate them before. This is one of my favourite dessert. I’m looking forward to making this recipe soon. Lol that’s too funny. I am a Rusev as well! I used to live in South Carolina but got married and now live in Everett. I have a ton of family in Tacoma that I haven’t met.. who knows you might be one of them! Lol I made this the other day and it turned out amazing! Thank you for the recipe! I only have 4 ramekins and was wondering if I can pour the batter into the the ramekins and keep the rest in a bowl until my first batch is complete? Also if I was to make this ahead of time and refrigerated would it take longer to bake if the batter is cold? On your about me section you mention Bulgarian food. Are you Bulgarian? Valentina, you can definitely make the first batch ahead of time and reserve the rest in a bowl. but you don’t want to keep it refrigerated for too long because the batter will get really thick. The cold batch will take a little longer to bake. And yes I am half Bulgarian. My mother is full Bulgarian. Her maiden name is actually Rusev 🙂 Where are you from?